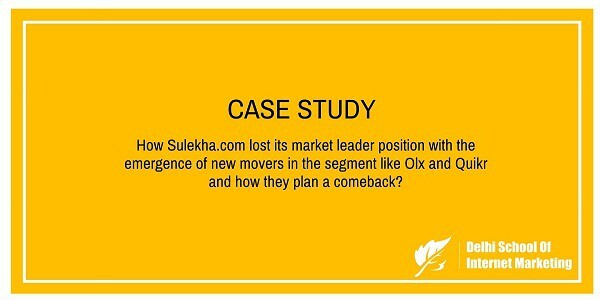 Case Study:How Sulekha.com lost its market leader position with the emergence of new movers in the segment like Olx and Quikr and how they plan a comeback? Home > Blog > Blog > Case Study:How Sulekha.com lost its market leader position with the emergence of new movers in the segment like Olx and Quikr and how they plan a comeback? Sulekha.com is one of India’s largest and fastest-growing digital platforms for local service need fulfillment in more than 40 cities, connecting over 10 million of users and local businesses in 800+ need categories such as computer training, serviced apartments, wooden flooring, party catering, baby-sitting, elder care, yoga lessons, kitchen renovation, wedding photography, moving-packing, pest control, event planning and auto repair. Sulekha has 14 offices and 1,300+ employees across India, including Delhi, Mumbai, Pune, Ahmedabad, Hyderabad, Bengaluru, Kolkata, Chennai, Austin. Satya Prabhakar, the founder of Sulekha, graduated from NIT, Trichyin Electronics and Communications, and then did his masters in Computer Science and an MBA from the renowned University of Florida, Gainesville. Prior to his entrepreneur career, Satya worked for about 12 years for many big brands like TCS, Honeywell, AT&T, and Philips in technical research, product development, business development and general management roles. Satya co-founded Presto multimedia lab while working at Honeywell as a platform to develop real-time video and audio technologies. Prabhakar later joined AT&T in Austin, Texas to lead several business and product development efforts in the areas of Internet hosting, e-commerce and interactive TV, and represented AT&T in the Americast interactive TV alliance. Satya born out in Machilipatnam, a small district of Andhra Pradesh started his entrepreneur career from Austin, Texas. After leaving the job from AT&T, Satya started working on his new idea. The idea was to develop yellow pages on the internet mainly dealing with local classified services. After doing a lot of research and brainstorming, Satya along with his wife Sangeeta Kshettry co-founded Sulekha.com in 1998 at Texas. The company grew steadily in United States and acquired a good user base. At the same time, the internet user growth in India showed a drastic hike and thus looking at the opportunity in the vacant space in India, Satya thought to expand its footprint to India. Thus without losing any time and their present base, Prabhakar in 2007 launched Sulekha.com in India as well. The launch in India was in a strategic manner and now they allowed their users to select their location in different states in the US & Canada. They very wisely and smoothly introduced this feature into a few cities of India too.India got fully-fledged operation of Sulekha in the year 2007. Around the same phase, a number of digital start-ups were born. These startups howeverdid well and captureda good user base, but didn’t succeed in capturing the local businesses. While Sulekha succeeded in capturing a mix of both–local businesses and users. Sulekha helped many SME’s to survive in the market by connecting them with their local audience. In its initial days, Sulekha had not charged even a single penny from the local businesses or from the audiences. It mainly relied on advertisements to generate revenue. But moving forward, Sulekha in 2009, started providing packages for its customers and charged a particular amount for it. This was the actual growth factor for the company. Sulekha in its initial period in India saw a huge success with its new marketing strategy under the supervision of the founder Mr. Satya Prabhakar but soon as other local classified service providers like Olx and Quikr emerged in the Indian market; Sulekha started losing its presence in the market. However, Sulekha today manages to get over 20 million unique visitors each month with 100 million page views. The company serves to more than 75000 SMB/SME paying for the services provided by Sulekha. With more than 4 million business listings and over 2 million active businesses, Sulekha offers various local services to its audiences. Growing in numbers, the company has now 15 offices in major cities of India and abroad. With a strong and skilled head count of more than 1300 employees in the company, it has transformed into India’s largest and top local service providing portal with an active presence in more than 40 Indian cities. With over 800+ categories like coaching, home and office service, entertainment, etc., Sulekha is growing as a digital place for small and medium scale businesses in India. There were two turning points in the journey of Sulekha.com. First one was when other players like Olx and Quikr emerged in the Indian industry then Sulekha lost its market leader position. And second one was when Sulekha in this year 2015 received funding so as to remain in the market and compete with the players like Olx, Quikr and Justdial. With the new players coming in the local classified market like Olx in the year2006 and Quikr in the year 2008, Sulekha started losing its existence in the industry. The listings were getting outdated and customers felt disappointed with the service offered which silently resulted in the decline of the user base. Although the company had received funding during its initial period but there was a need of more funding round to survive in the market and to remain in competition with the new comers like Olx, Quikr and Justdial. Sulekha survived two recessions in the industry and now the life point came for Sulekha recently in the early 2015 in the form of funding of around 175crores from Singapore’s sovereign wealth fund GIC and venture capital Norwest Venture Partners (NVP). Prior to that, they had also raised $8 Million from Indigo Monsoon, Mitsui and NVP. With the latest funding, Sulekha is trying to rise again in the market and it is to see what strategy the company is taking to get on the top of the local classified market with Olx, Quikr, and Justdial being in the market. Sulekha.com has its Facebook fan page with more than 158,772 fans. Company under the entrepreneurship of Mr. Satya Prabhakar is growing over and over. In 2013, the company launched its mobile app looking at the growth of the mobile customers. Using the app was easy and with just a single touch, user can have solution for all their local service needs. Talking about current scenario, about 40% of the leads come from the mobile app. The company will focus on the three fundamental drivers–time, cost and hassle–and the marketing campaign of the company will encourage people to download the app to use it as well as browse the Web for Sulekha With the funding coming in, the company will continue to excel in one core service that they offer. Additionally, the company will expand its footprint to more cities and categories.